Notice the shedder bar in the flow path. the flowing fluid produces flow disturbances called vortices. The resulting vortex trail is predictable and proportional to the fluid flow rate. This phenomena is know as the "Von Kármán vortex street" (see illustrations to the right). Sensitive electronic sensors downstream of the shedder bar measures the frequency of the vortices and produce a small electrical pulse with every vortex created. The electrical pulses also also proportional to fluid velocity and is the basis for calculating a volumetric flow rate, using the cross sectional area of the flow measuring device. 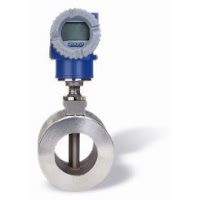 Vortex shedding flowmeters are used on steam, cryogenic liquids, hydrocarbons, air, feed water, and industrial gases. Splitting higher viscosity fluids into concordant vertices is extremely difficult due to the internal friction present, so using vortex shedding flowmeters on high viscosity media should be avoided. Also, avoid applications with low flow rates and low Reynolds Numbers, as the vortices created are unstable. Consideration must be given to applications with low Reynolds numbers, as the generation of vortices declines at critical points of reduced velocity. Low pressure can also be a problem in this regard. Users must take Reynolds number, velocity, and density into consideration before choosing a vortex shedding flow meter. As always, it's best to discuss your application with an knowledgable support professional before specifying, purchasing, or installing this type of flowmeter. Watch the video below for more information on vortex flow technology. For more information on vortex shedding flowmeters, visit https://www.meadobrien.com or call (800) 892-2769.